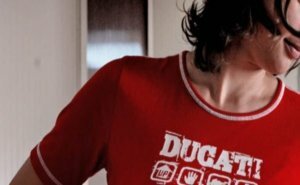 With Italian the boundaries between design and style becoming ever more blurred, many Ducati motorcycle devotees have been waiting with baited breath for the fashion shows highlighting Ducati's 2008 Motorcycle Clothing Collection. Well, wait no longer, the fashion shows start at selected dealers across the US and Canada from today! Ducati dealers from coast to coast will be showcasing the 2008 Ducati Apparel Collection with fashion shows and displays. The Ducati Apparel Collection fashion shows started in 2006 and have become highly anticipated events at dealerships, motorcycle races and other venues across the nation. At select dealerships , the night of Friday, April 25 will rev up the style with fashion shows from So Cal to Toronto. The Fashion shows and Ducati displays will continue into the weekend. Of course, in addition to the entire line of Ducati apparel, all the latest 2008 Ducati motorcycles and accessories will be on display.